If you have a business that requires contacting large numbers of clients and customers or other contacts, MaxBulk Mailer will save you lots of time! Maxprog has created the ultimate tool for all of your email marketing needs. MaxBulk Mailer allows you to design and send professional looking emails to your customers and prospects for as little as fractions of a penny...directly from your own desktop. Here is a breakthrough tool from Maxprog that will allow you to increase your profits, strengthen your customer service and send your messages to new markets. MaxBulk Mailer is a full-featured mail-merge tool for Macintosh that allows you to send out customized press releases, prices lists and any kind of text or HTML documents to your customers. MaxBulk Mailer is fast, fully customizable and very easy to use. MaxBulk Mailer handles plain text, HTML and styled text documents and gives full support for attachments. With MaxBulk Mailer you will create, manage and send your own powerful, personalized marketing message to your customers and potential customers. MaxBulk Mailer is a software tool that you purchase once, no need to pay on a per-email basis to submission services. 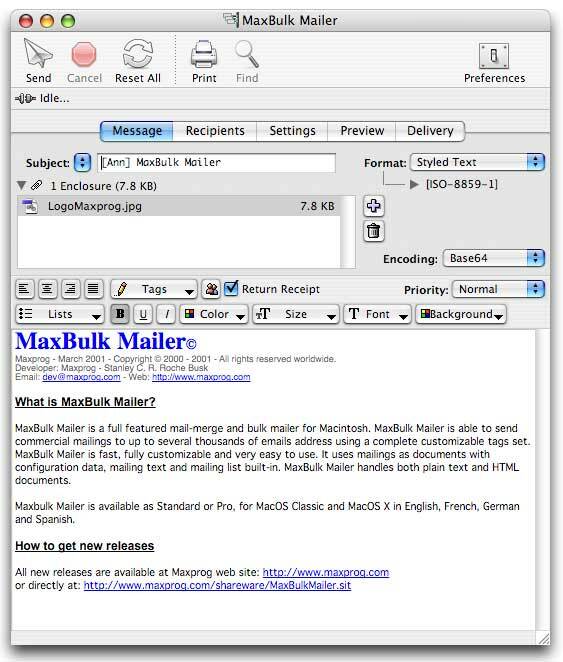 MaxBulk Mailer supports drag and drop from the Finder with both Mac OS 9 and Mac OS X like any other Macintosh tool. Full ISO-8859 support for international characters. Full POP, APOP and ESMTP Authentication. Permanent X-Mailer SMTP Header to avoid spamming uses. Full mySQL and postgreSQL database support. Recipients creation directly from Filemaker. CheckMail - A powerful POP3 email checking program! Chrysanth Mail Manager - Take action to stop all the spams now! Duplicates Remover - Search and processing of duplicated emails. Emoticons Mail - Insert graphical Smiley Icon and Emoticons into email.